The author graduated in medicine at the University of Manitoba in 1911. He taught at the university and practised surgery in Winnipeg until he moved from Manitoba in 1951. Dr. Fahrni now resides in Vancouver. My father’s birthplace was a small town, Unterlangenegg, about six miles from the city of Thun which is situated on the shores of Lake Thun. This part of Switzerland is known as the Bernese Oberland. The name “Fahrni” is rooted in history in this section of Switzerland. In the year 1742, the name appears in the birth and marriage registers as FARNI, which means a fern. Even as early as this, the family crest consisted of a fern depicted by two graceful fronds of this branching plant. In the old family registers, a generation after 1742, the name appears as FAHRNI. It would appear that some two hundred years ago the Teutonic influence inserted the letter “H” and this spelling has been perpetuated since. The earliest record of our family’s direct antecedents is the birth record of David Fahrni in the year 1764 in the vital statistics record in Unterlangenegg, a town a few kilometres from Thun, Switzerland. The succession from one generation to the next, which follows, is an abbreviation of the detailed family tree, which includes all the sons and daughters and their marriages in each successive generation and may be referred to by anyone particularly interested in the broader application of the influence of the Fahrni family. David Fahrni, born 1764, married Magdalena Stegmann. Their son Christian was born in 1792, and married Susanna Reusser. Their eldest son, Christian, was born in 1821 and married Magdalena Anderegg (my grandparents). My father, Christian, was born in 1848, and married Priscilla Hyndman in Canada, in 1881. From this marriage, two daughters and four sons were born. My father’s father was also Christian Fahrni. He left the family when the children were small and my father, Chris, being the only son was pressed at an early age into helping to support his mother and three sisters. His first job was that of a hotel porter in the nearby great city of Berne. As a side occupation he raised pigeons for the market, which brought in some extra money. He next went to Monaco on the Italian Riviera and got a job as hotel porter in the nearby city of Nice, France. It was while working there, that he became aware of the opportunities in the new America and in the hope of making a home for his mother and sisters he immigrated to the state of Iowa while still in his late ‘teens. On arrival in Iowa he obtained work, took up land, and in a short time was able to accumulate funds sufficient to bring his mother and three sisters from their home in Switzerland to join him there. In the meantime his roving enquiring spirit once more drove him to participate in the development of the Canadian West, which at that time was receiving considerable publicity. He used to tell us, in the vernacular of the day, that when he married off his two older sisters, it provided a home for his mother and youngest sister and left him free to follow his inclinations to explore more remote and challenging fields. With his horses and wagons he went north to St. Paul, Minnesota, where he met three men from Ontario each with their horses and wagons, en route to Fort Garry, Canada, and together the four men trekked over the prairie northward to Moorehead, Minnesota, where the wagon train boarded a steamer which took them down the Red River to Fort Garry. It was in the year 1871 when they disembarked near the confluence of the Red and the Assiniboine Rivers. These four menD. D. Aitken, Davidson, Swazey and Fahrni were some of the early settlers, who helped develop the Canadian West. D. D. Aitken remained in what was soon to be named Winnipeg and established a prominent building and house moving business. Davidson went to the Neepawa area and Swazey further west, ultimately to the Moose Jaw country. My father remained in Winnipeg and set up bachelor residence with three other early settlersJ. H. Ashdown, James J. Hill, and a Mr. Scott. These men all made a big contribution in their respective fields. James H. Ashdown built up a large hardware business throughout the west and James J. Hill promoted and built up a railway Empire in the United States, while Mr. Scott developed a business in Winnipeg. My father used his horses and wagons first for drawing sand for the first attempt to challenge the glue-like Red River mud that formed the streets of this Red River settlement. The sand was used in macadamizing the ground surface of what is now Main Street, Winnipeg, by using blocks of wood with all the intervening space packed with a mixture of tar and sand. Indeed this macadamized surface of Main Street served the community well, for many years. It was ultimately replaced when asphalt and concrete took over. He used his horse teams to haul explosives which came up by water-transport from St. Paul, Minnesota, for construction of the Canadian Pacific Railway roadbed through the rocky country of Western Ontario. With the development of the western prairies there came a great demand for merchandise of all kinds not the least of which was food-staples. The only means of transportation was by foot or horse or ox-drawn carts or wagons. The Red River cart was an early vehicle, sometimes drawn by oxen, but my father with his horse-drawn wagons was able to out-travel those more cumbersome and slow caravans. He established a freight service from Winnipeg to Edmonton, then known as Fort Edmonton, a distance of some nine hundred miles by the northern sheltered route. He travelled the old Fort Garry-Edmonton trail, the beginning of which was the present Portage Avenue, Winnipeg, which angles westward from Main Street along the north shore of the Assiniboine River, cutting across the prairie westward to old Fort La Reine, now known as Portage la Prairie. The trail then continued west by northwest to the White Mud River at what is now the town of Westbourne, where the first crossing of the White Mud River was made. After fording the river the trail continued westward for nine miles where the river was again forded, near what is now the village of Woodside; this was known as the second crossing. The trail then continued westward south of the river for ten miles when at the third crossing the river was again forded just one half mile west of what is now the town of Gladstone. The north shore of this crossing was an old Indian camping ground and as the traffic developed on the trail, it became a favorite camping spot. The campsite was situated on a rise of ground which was always comparatively dry in wet weather. The river water was clear and inviting not only for drinking and cooking, but also the area was a small oasis for the weary, dusty traveller, to cleanse and refresh himself by diving in “a la natural.” In the spring of the year, fish in abundance were available here as they came up from Lake Manitoba to spawn further upstream. Continuing westward the Edmonton trail, sometimes winding a bit to avoid hills, and valleys, led to Fort Ellis. It then took a more north-westerly direction to the more heavily wooded country, then continued westward to Fort Edmonton, situated on the high banks of the North Saskatchewan River. My father travelled back and forth over this trail for a number of years carrying needed provisions and supplies to people in this primitive section of the prairies, many of whom were the real pioneers of the country. His was not a seasonal job. In the Spring, he had mud and heavy going to combat, due to the change from frozen snow-clad ground of winter to pools of water and wet soggy ground that was often a challenge to the strength and stamina of his horses hauling the heavily loaded wagons. The severe winters presented still another challenge. He travelled alone with his watchdog, Lion, and usually two teams of horses, each hauling a wagon. The rear team was tied to the front wagon on which father was seated driving the front team. In the winter it was necessary, in addition to his merchandise, to carry enough oats and hay for his horses. There were few inhabited areas where he was able to supplement his supply of horse feed. His personal food supply consisted chiefly of Pemmican and Bannock. The former was dried and cured buffalo meat, into which Saskatoons and blueberries had often been pressed. This supplied the protein and some mineral and vitamin needs for good nutrition. Bannock consisted chiefly of flour and water with no leavening and when baked was firm and not particularly appetizing but it provided the calories from its carbohydrate content to meet the challenge of heavy physical activity. In the late spring, summer and fall, the hay situation was pretty well taken care of when at noon and overnight he hobbled his horses and let the graze on the abundant growth of grass. During the winter months when a severe blizzard blew up he sought sanctuary at some stopping place if at all possible; but not uncommonly, particularly on the western leg of the trail, he was far from any settlement. He would try to find a sheltered wooded area where he would blanket his horses, feed them well, then wrap himself in buffalo-hide robes, and burrow into the snow where he slept in warmth and comfort. When the blizzard was over both he and his horses were rested and resumed their trek in the bitterly cold, but calm atmosphere that so regularly follows the lashing snow and windstorms. Any semblance of a trail would now be wiped out by the drifting snow of the blizzard. This made the going all the more difficult and his heavily loaded sleighs required an extra effort by his well-conditioned horses. On his return journey he always extended his camping time when he reached the third crossing of the White Mud River, the site of which has already been described. This crossing is approximately one hundred miles west of the city of Winnipeg. This camping ground is on the north bank of the river, an elevated area which slopes down gradually, terrace-like, to the water. He had often thought of homesteading and proving up some land with a view to settling down and thus ending his rather peripatetic pattern of life. He chose a quarter section, less than a mile northwest of the third crossing, his old camping site. The description for the records is SE¼ Section 6; Township 15; Range 12. He stopped over periodically for a week or so and with his horses and rather sparse machinery did the necessary work to acquire title to the property. Gradually he found himself spending longer periods of time improving the farm. He built buildings and established batch-hall quarters and he found these intervals a welcome change from the rigorous freighting routine. Halfway from his farm to Winnipeg by the side of the trail, there lived a family by the name of Hyndman. This was just four and a half miles west of what is now the town of Poplar Point. Wm. Hyndman was born in Donegal, Ireland, and his wife Susan’s family, nee McFadden, was from County Fermanagh, also in northern Ireland. They were married in Bruce County, Ontario. The family had come out to Manitoba a few years earlier. There were five daughters and three sons in the family. The eldest daughter, Frances, had recently married a Methodist minister, Rev. John Walton, who had been posted to Fort Edmonton, where in due course their first baby was born. The sagacious grandmother thought of the day when the baby’s milk supply in the fullness of nature would go dry. To meet this need, as there were no milk cows at Fort Edmonton, she prevailed upon my father to lead a cow which they thought would freshen shortly after arrival in Edmonton, and thus provide milk for the infant. The first few days on the trek west Bossy did very well tied behind the second wagon, but before the journey was half completed she developed a limp. Father found that her split hooves were not designed for travel across the country at the pace set by his horses. To meet this abrasive insult to the bovine’s feet, he used cured buffalo hide to make shoes for Bossy, lacing them with thongs cut from the buffalo hides. Before he arrived at Edmonton he had to renew the shoes periodically as her pointed hooves wore through the leather shoes. Shortly after the arrival the cow gave birth to her calf and the young Walton infant daughter was assured of her milk supply. She was reported to be the first white child born in Fort Edmonton. While he was working on his homestead, my father cut his foot and it became infected. He started for Winnipeg but when he got as far as the Hyndman farm he was so ill that they put him to bed and over a period of two weeks treated his infected foot and his fever from the complicated blood poisoning. The importance of this incident lies in the romantic outcome. By the time he was again able to travel he and the third daughter, Priscilla, a tall brunette young woman, had become engaged. 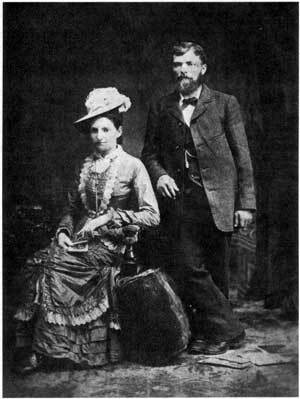 They were married a year later on July 12th, 1881, near Emerson, Manitoba, by the Rev. John Walton, the recipient in Fort Edmonton of the cow some years earlier. My mother was twenty years of age; my father thirteen years older, thirty-three. This was just ten years after his arrival in Manitoba. A few years after arriving in Canada my father who was interested in horses established a livery and feed barn on what is now the corner of Market and King Streets, Winnipeg. The old Seymour Hotel was later built close by the barn. Following his engagement and marriage he divested himself of this interest and he and his bride soon took up residence on the homestead just north of the third crossing of the White Mud River. This brought an end to his freighting exploits on the old Fort Garry-Edmonton trail. I am indebted to Bill McCombe of Gladstone, Manitoba, a son of an old pioneer of the district for the above quotation, which reflects the energetic and aggressive spirit of my father. A few years later, not long after the C.P.R. line through the mountains was completed in 1885, he learned that the isolated residents of many mountain villages, most of whom serviced the railroad, had no milk supply. By arrangement with the railway officials he loaded a car of cows all in calf and accompanied them west. The train with the cows aboard was expected at the different mountain stops. There were no loading or unloading platforms and the season being wintertime with the usual heavy mountain snowfall, at each stop as the cow or cows were claimed they were shoved through the car door into the snowdrift and the train moved on. It was on this trip that he was attracted to the Okanagan Valley which he visited by changing trains at Sicamous and going south on the branch line through Enderby and Armstrong to Vernon. He went out later and homesteaded ten miles south of Vernon, B.C., just west of the old Mission Road on what used to be known as the Commonage. This was a broad valley extending south and beyond to the Okanagan Landing. On his half section he built a house and barn out of logs cut from the abundant supply of timber on the edge of the farm. Just over the heavily-wooded hill or miniature mountain to the west was Okanagan Lake. To the east across the valley the ground rose gradually and after a mile or so of stunted, sparsely-growing pine, the top of the hill provided a beautiful view of Long Lake which is now called Lake Kalamalka. The east slope descended somewhat precipitously to the water’s edge. It is along the west bank of this lake that the Vernon-Kelowna highway is now established. When the house was ready and part of the land broken and seeded, my father sent for the family. In November 1894 Mother and her brood of six, two girls and four boys, the youngest a babe in arms, travelled by C.P.R. to Vernon. We were met by my father at Sicamous, where we changed to the branch line and proceeded to Vernon. From there we drove by team and democrat the ten miles south on the Mission Road to the new homestead. The youngest of the family, Marguerite, had been born October 9, 1894, about four to five weeks earlier. My father had the foresight to keep possession of the Gladstone farm. He left the Dilk family, who had been working for him, in charge of operations as he was not sure that my mother would approve of bringing up her family in the rather isolated Okanagan area. There was no school closer than Vernon ten miles away. Within a radius of three miles, there were only three familiesall new to the country. The life was primitive but interesting to us all except my mother, who was worried over the lack of schools, churches, and other amenities she thought should be available to a growing family. An abundance of rattlesnakes on the Commonage poised a continual threat, as she thought, to children trouping over the land. Indeed to the older boys it became quite a game as to how many rattlers we could bring in after a sally across the sun-baked land. The trick was to watch where you stepped; usually the snake would give the warning rattle, and being out of his striking distance, elevate his head several inches from the ground, and with a stout stick like a cane, we would swish it across the neck or upper body. This broke the spinal column and the spinal cord damage meant a quick and sudden death. We dared not divulge our trophies to our mother, but our father took a more sporting view of the situation. The itinerant, sleeping at night on the ground, might awaken in the morning to find a rattlesnake had crawled under his blankets to share his warm bed. These were the stories told by passing travellers and their advice was to lie quietly until the warmth of the rising sun lured the serpent from its cover. To keep a record of our trophies we cut off the rattle from the caudal appendage of each snake and left it to dry in the hot sun. The log house and log barns served us well; there was a body of water about six hundred yards in diameter close by which was a welcome watering spot for the horses and cattle. Indeed, this small lake bore the sign “FAHRNI LAKE” until drained about 1955. We grew most of our vegetables and our meat supply was venison. I can remember on different occasions my mother told our hired man, Ed. Anderson, that the meat supply was low. In the early morning he would take his rifle, walk into the woods which climbed westward towards the Okanagan Lake and when we heard a shot, one of us youngsters would ride a horse with harness and whiffle-tree with chain attached to meet the hunter and drag our mule deer down to the barn for dressing of the carcass. Father tried growing wheat with indifferent results. Oats and barley did better but with no irrigation he decided that the Okanagan, particularly the arid Commonage was not a grain growing area. With a stunted crop in shotblade a grasshopper plague came along unexpectedly and cleaned off all the crop. This was the last straw, and with the death of a neighbour’s child from a rattlesnake bite, the decision was made to return with the family to the Manitoba farm after an absence of some three years. The children of school age had returned the year before. My father rented his Okanagan half-section until 1912 when he traded it in on the purchase of a home on Fernwood Road, Victoria, B.C.. to which my father and mother retired at that time.